PediaSure is the #1-recommended children’s nutritional supplement. Reformulated PediaSure also has a delicious new taste. It’s available in a wide variety of “Kid-Approved” flavors that are easy to find. Just look for the “Great New Taste and Improved Formulation” message on the new Pediasure label! PediaSure may be used as a nutritional supplement with or between meals, or as an ingredient in recipes to help add calories to your child's favorite meals and snacks. PediaSure may also be a sole source of nutrition. PediaSure meets or exceeds 100% of the NAS-NRC RDAs for protein, vitamins and minerals for children 1 to 8 years of age in 1000 mL, and for children 9 to 13 years of age in 1500 mL. Talk to your child's doctor about how PediaSure may help meet your child's nutritional needs. Precaution: Pediasure is not intended for infants under 1 year of age unless specified by a physician. "Kid Approved" vanilla, chocolate, strawberry, banana cream, and orange cream flavors encourage compliance. 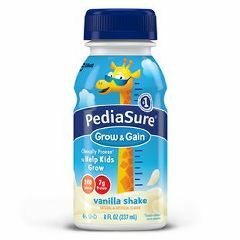 Pediasure Product information and values are subject to change. Please refer to product label or packaging for the most current information.